EnterYourHours.com is an hourly tracking and billing software system that allows you to track time, generate and send invoices, view reports, simplify everyday accounting, and so much more. Ideal for law firms, marketing companies, IT consultants, industry professionals, and anyone who bills by the hour. iPhone App - Free Account Available! At the core of the EYH system are the records of all the work performed. Anyone performing work that will get billed to a client, or simply needs to be tracked for auditing purposes, will enter this information into EYH. As you can imagine, the process is incredibly simple. Viewing what's been entered is a snap. Perhaps you want to verify the numbers are correct, or do a gut-check of how much money you made that week. 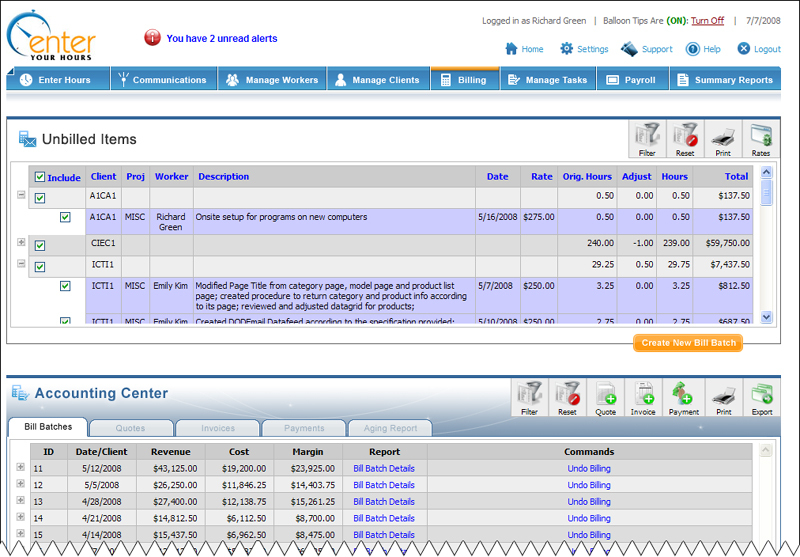 With filters and the summary tab, you can view any slice and cut of your business. Track multiple timer sessions throughout your work day. Stop a timer for one client or project, and then start the timer for another. Return to the first timer and pick up where you left off. You can run up to ten timers per day. 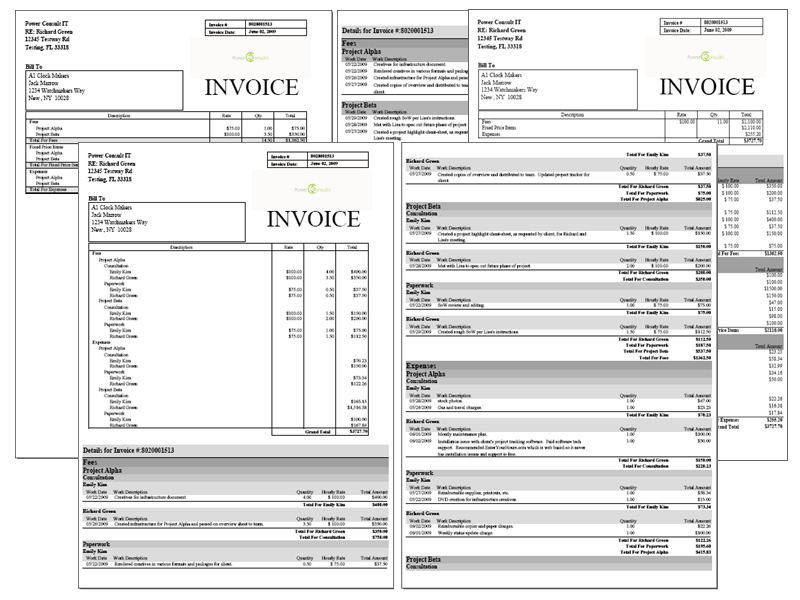 Invoices can be customized in a variety of ways. 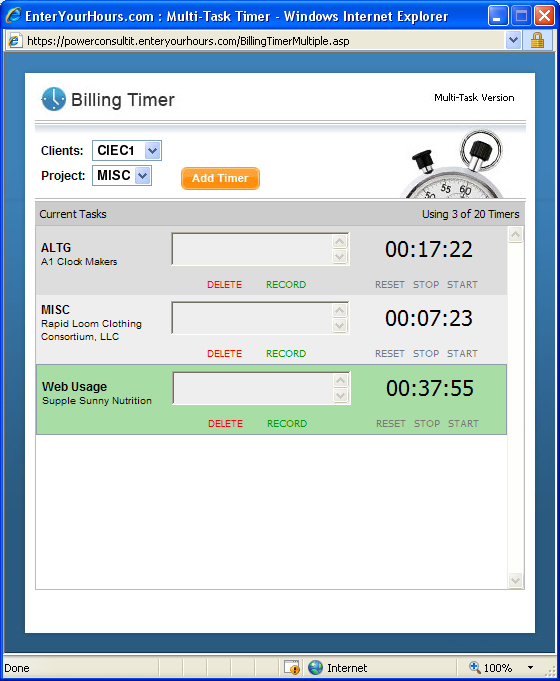 You can also control the way your billing information is displayed by choosing to roll up your hours or break them out by project, activity, worker, date, or any combination you choose. Statements allow for a more streamlined approach when dealing with billing. With Statements, your customers receive a snapshot of unpaid items which is helpful in keeping your cash flowing. Bill using any methodology you want; date-based, by client, by worker, or just gather everything in the system and start shooting off invoices. The filtering and batching system gives you precise control of when your invoices go out, while making sure you don't double bill, or forget to bill. One click creates the invoice. Another click opens up the preconfigured email form, and the final click sends it off for payment. It's that simple. Store your client data include base billing rate, and override billing rates based on workers. 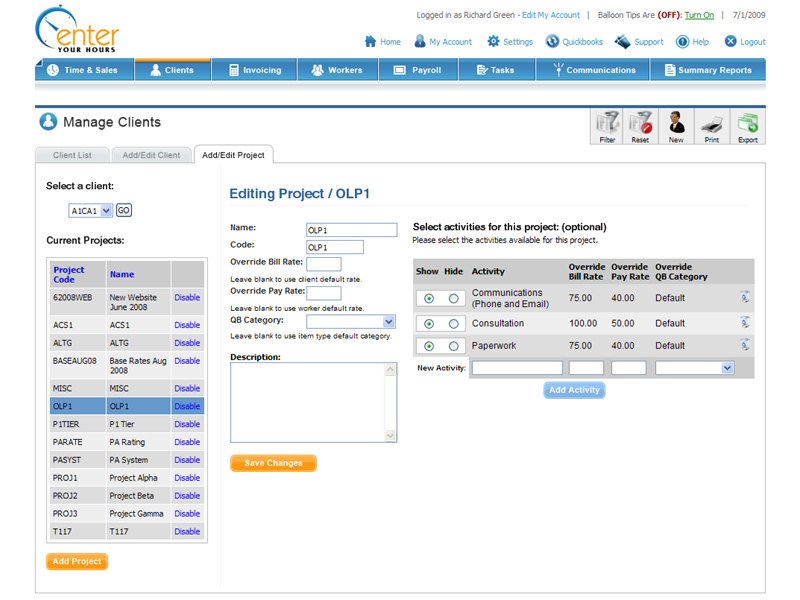 Create, edit, and delete projects and activities for your clients, and put in override rates at any level so you can precisely control how your client is billed. Design a unique welcome message for your staff members, and change it as often as you like. 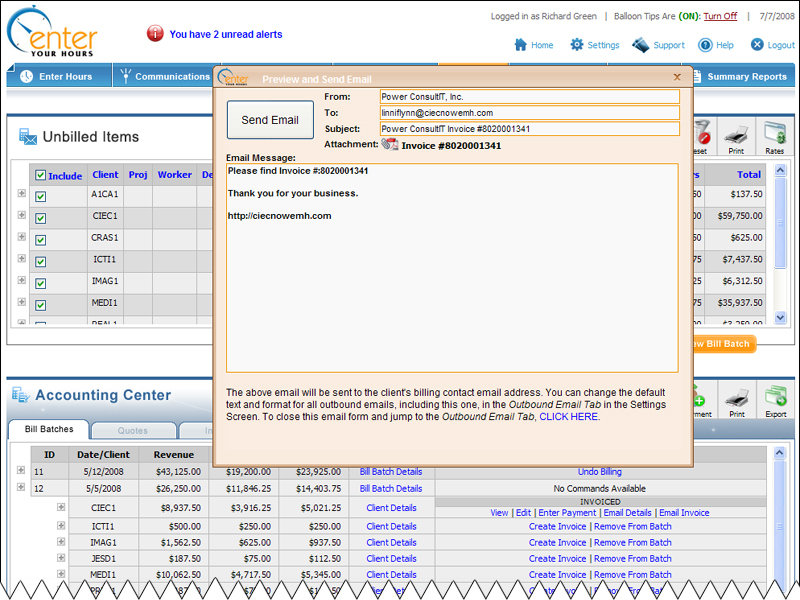 Link your clients to QuickBooks and transfer invoices individually or in bulk. * Integrate with QuickBooks Pro, QuickBooks Enterprise, or QuickBooks Simple Start. *Only available with certain plans. See the Pricing Page for more details. Our free IPhone app, EYH Billing, lets you enter hours, send invoices, and look up information on the go. It's a free add-on with your paid EYH plan. Link to the ITunes Store: EYH Billing App. 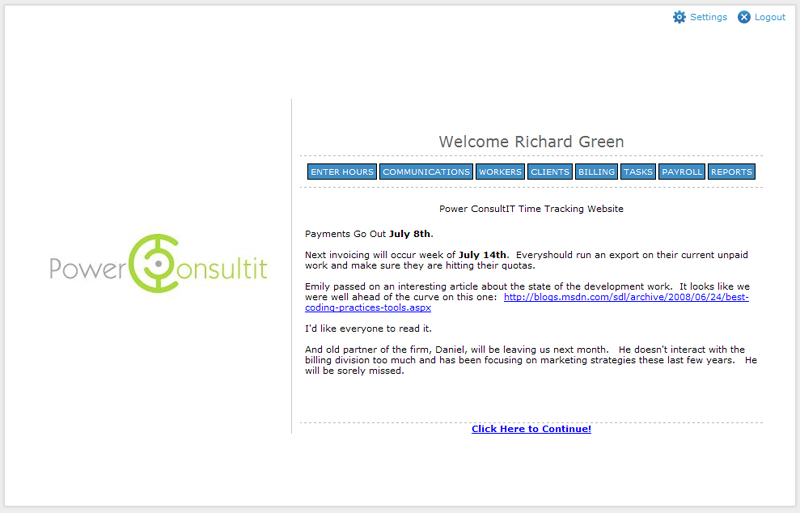 Our online billing system has everything you need to track your time, and bill your clients. Most importantly, you can do it quickly and accurately. We make it easy for a busy or novice user to bill all of his or her hours, but for specific or advanced tracking, we also include a large range of standard industry features like project and activity tracking, multi-task timers, balance tracking, trust accounts, and more. Use our advanced features when you need them, or our simple, default interface when you don't. What kind of Software is EnterYourHours.com? As a legal professional, you need to track retainers, set up trust accounts, and control the billing cycle in a way that keeps your clients happy. Maybe you need to bill specific rates for different clients, projects, and activities or adjust an associate hours. Our legal billing software takes care of these hassles so you can focus on earning revenue. Read More..
EnterYourHours.com has a robust, multi-task timer that allows you to time your hours for all of your clients throughout the day. 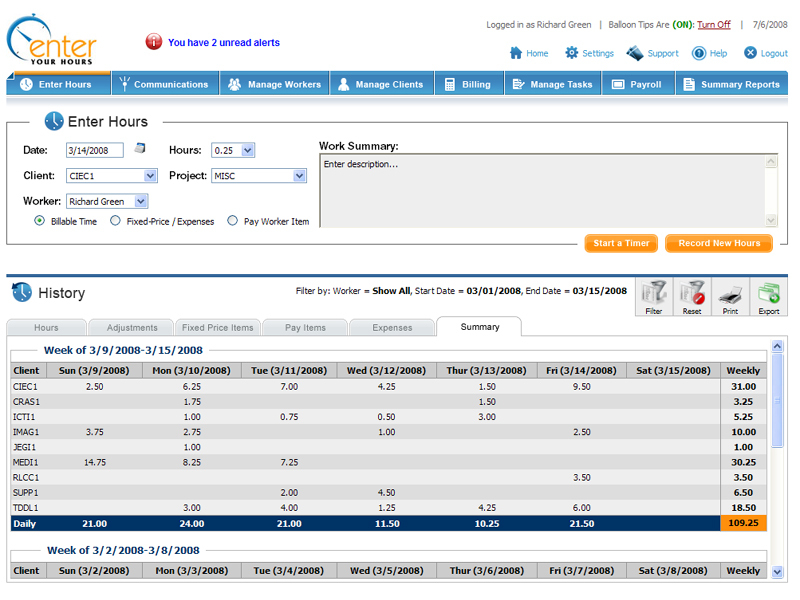 It's adhoc reporting capabilities and easy to read timesheets makes tracking your workers quick and easy. 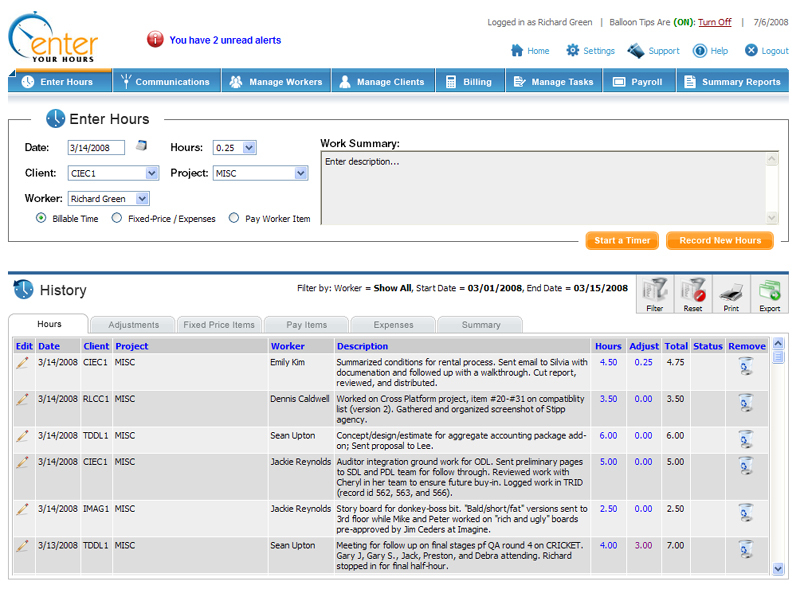 You can see onscreen summaries by workers and clients for an intuitive feel of how hours are spreading out. Read More..
EnterYourHours.com has many of the features of larger ERP systems, but was designed for the business owner that doesn't have time to learn complex software. Rest assured, those features are there, but we made sure to keep them out of your way if you don't need them. Billing that takes only minutes lets you focus on what you do best: Earning money. Read More..
Law firms that bill by the hour can control their billing cycles in a quick, efficient, and accurate manner, but our software also supports law firms that perform fixed-price services or work on a contigency basis. Our fixed-price features include quick-lists and recurring fees, and our trust accounting capabilities allow you to handle contingency payments and retainers. 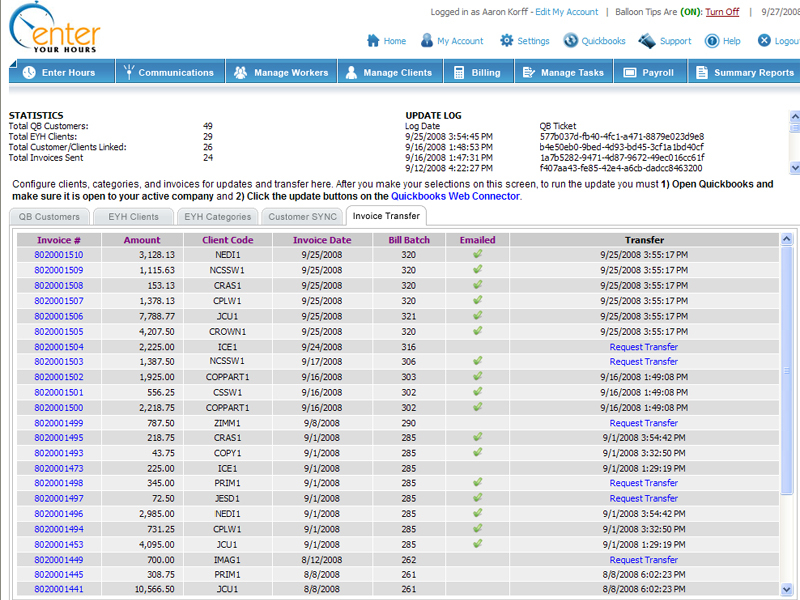 Read More..
With a name like ours, clearly EnterYourHours.com supports the hourly billing professional. Since our inception in 2008, we've added a wide range of companies to our customer list. Our customers include private investigators, accounting firms, home decor specialists, IT companies, clinical research management organizations, and property associations to name a few. Read More..
Marketing and PR Firms like EnterYourHours.com because of our ability to track multiple project and activities across all of their hourly billing, flat fee services, and expenses, which is a range of needs most Marketing and PR firms will understand. We also have a lot of invoice customization which is critical when a client expects their billing broken out in a specific way. Read More..
You can check our types of billing software page if you still aren't sure if EnterYourHours.com is the right software for you.